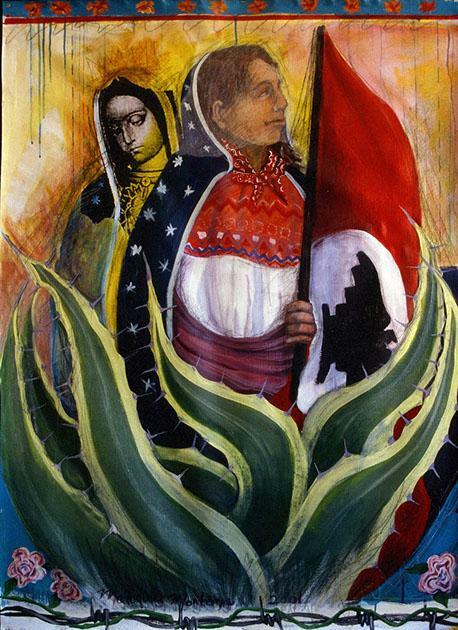 “Virgen Campesina” painted by Malaquías Montoya in 2001. The art of Malaquías Montoya exposes its viewers to uncomfortable truths. The woman on the bus on her way home after working a long day; the mother bent over in the fields picking cotton, and then rushing home to her children, preparing their meals and getting them ready for school the next day; the farmworker who had never imagined she’d be carrying the Huelga (strike) flag, striking for better wages, working conditions, and dignity. Montoya’s art is explicitly political. “As a Chicano artist I feel a responsibility that all my art should be a reflection of my political beliefs—an art of protest,” he wrote in his short bio for a 2003 exhibit entitled One Struggle, Two Communities: Late 20th Century Political Posters of Havana, Cuba and the San Francisco Bay. Montoya’s work has existed at the intersection of art and politics for close to 50 years. Montoya sees his artistic identity as giving voice to a community that society had deemed silent and voiceless. “Realizing later that it was not by choice that we remained mute but by a conscious effort on the part of those in power, I realized that my art could only be that of protest—a protest against what I felt to be a death sentence,” he said to me in an interview in October 2018. “Women Crossing” painted by Malaquías Montoya in 2014. Montoya’s political paintings, screen prints, and murals have always been aimed at serving the underrepresented, the neglected, the subaltern, the oppressed, and the abused. Over the years, his work has helped social justice organizations such as the La Raza Centro Legal, United Farm Workers, the Olga Talamante Defense Committee, the Third World Women’s Alliance, and other organizations working on criminal justice issues, political prisoner struggles, and anti-death penalty advocacy. Through his art, Montoya highlights these organizations’ struggles for immigrant rights, worker’s rights, women’s rights, the fight against racism, war, and U.S. imperialism. “Montoya is one of the movement soldiers who’s kept the flame of social justice art alive ,” said Lincoln Cushing to me in an interview. “He consistently ignored the path of art world fame in favor of community impact and principled politics.” Cushing is a social justice artist and art historian. Montoya’s work doesn’t just proclaim inclusion and recognition, it demands as much from the viewer. Viewing a Montoya work is not a passive experience. The work demands recognition of and solidarity with the pain and suffering of the poor, the oppressed, and the invisible. “The tradition of Mexico’s great socially conscious artists, including José Guadalupe Posada at the turn of the 20th century, the Taller de Gráfica Popular beginning in the 1930s, and the graphic artists of the 1968 Mexican student movement,” said Ed McCaughan, Professor Emeritus of Sociology at San Francisco State University and author of Art and Social Movements: Cultural Politics in Mexico and Aztlan. Montoya’s powerful and poignant exhibit of original paintings and prints entitled Women I Have Encountered/Mujeres que he Encontrado, is currently on exhibition at the Vacaville Museum in northern California. The exhibit includes 30 chosen works—featuring a wide variety of media, including oil and acrylic paintings, collage, charcoal drawings, and silkscreens. In an interview at the Vacaville Museum in early October 2018, Montoya told me that his work grows from his encounters in everyday life in the U.S.-Mexico borderlands. He emphasized the suffering caused by U.S. policies, pointing to NAFTA and U.S. border militarization. The work also takes inspiration from his mother, Lucia Saíz Mointoya, who he says suffered physical and emotional abuse from his father, yet still kept the family together. ‘We Serve the World” painted by Malaquías Montoya in 2003. When the crops were in, he was sent to school. “In elementary school I was placed in a class that was at that time, or a few years later, labeled an “MR” class, what they called a ‘Mentally Retarded’ class, that became also a ‘Slow Learners’ Class,” Montoya told me. “Instead of helping us get ahead, the teacher would come in with a box full of paper, construction paper, pencils, crayons, chalk, whatever, and that’s what we would do, pretty much all day long.” It was there that Montoya first realized he could draw. This created the groundwork for his life-long journey as an artist at the forefront of the struggle for social justice. In his early drawing in the later 1960’s, he was drawn to the farmworkers’ struggle. “When I started drawing, the first drawings I did were always about people that I knew, which were farmworkers. The early drawings I did, the early silk screens that I did, were about farmworkers. I was excited about what César Chávez was doing, representing us, and I was one of them, you know, and I all of a sudden felt good about what he was saying,” Montoya said. “El Picket Sign” painted by Malaquías Montoya in 2009. Over the decades, Montoya has continued to devote his art to political struggles. His most recent work has focused on women’s rights, the death penalty and immigration issues. A few years back, the Smithsonian Institution acquired three of Montoya’s works: “Undocumented,” 1980; “George Jackson Lives,” 1976; and “Vietnam/Aztlan,” 1973. They have acquired others through donations by various collectors. In 2012, Montoya, who today is 81 years old and lives with his wife Lezlie Salkowitz-Montoya in Solano County, in Northern California, painted a large mural at the UC Davis Student Community Center. Earlier this year in nearby Vacaville, he designed and helped complete a Markham Elementary mural dedicated to the late Anne Starr, a beloved teacher who once worked at the school. Montoya’s work can be seen on his website @ www.malaquiasmontoya.com. Many thanks to veteran journalist and activist Bob Barber for recording and transcribing our interview with Montoya.